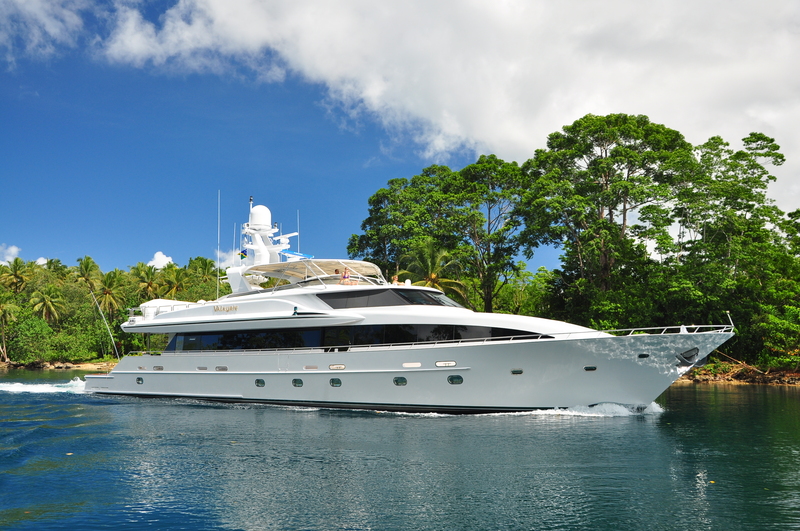 Many of these yachts have virtual tours which can be accessed via the ‘Virtual Tour’ tab on our website. Please contact our office should you wish to set-up a private inspection during the Miami Show or with any additional questions! 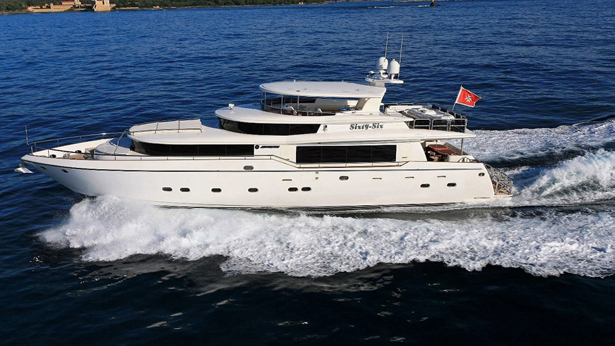 RJC Yacht Sales & Charter close on the 87′ 2003 Johnson MY, SIXTY SIX, in France. SOLD! 87′ 2003 Johnson, MY, SIXTY-SIX -by Raymond W Young. The vessel lying in Golfe Juan, France was listed by Jeremy Bottau at Ocean Independence. Built in GRP by Taiwanese yard Johnson Yachts to a design by Bill Dixon, she was delivered in 2003 as one of the yard’s Johnson 87′ series and is MCA compliant. Accommodation is for eight guests in a master suite, VIP stateroom, double and a twin – all with en suite facilities. One of most notable features of this yacht is the on deck master suite with a 180 degree panoramic forward view from the bed: unique on a yacht in this size range. Outdoor spaces are plentiful. The aft deck is large and sheltered from the sun while the flybridge has a hard top, three helm chairs, U-shaped seating and a wonderful area for casual el fresco entertaining and dining aft. The saloon is spacious with comfortable seating and a formal dining area seating eight guests. Twin 1800HP MTU engines give her a cruising speed of 18 knots and a range of 500 nautical miles at 12 knots. SIXTY SIX was asking $1,650,000 Euro. Congratulations Raymond! Bob Cury of RJC Yacht Sales has taken over the Central Agency on the 120′ 2001/2011 Crescent CMY, VALKYRIE, with a $500k price reduction making her new asking price $6,495,000. This original owned yacht was built for a very experienced yachtsman and sportfisherman. 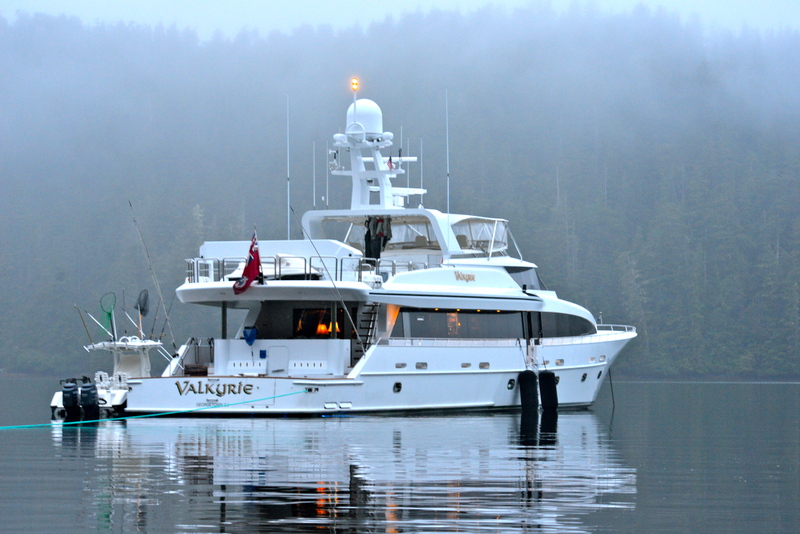 The vessel was designed to travel the world on her own bottom while providing the most comfortable platform for sportfishing with yacht quality comfort and accommodations. Her 6000-mile range at displacement speeds along with a shallow 6â6â draft and on-deck tender storage, allow her to circle the globe without limits. She features a four stateroom layout with a custom mahogany interior and is equipped with all the large yacht options to include 2011 twin 1800HP 16V-2000 MTUs with 3800 hours, twin Northern Light 65KW generators, Naiad stabilizers, American bow thruster, (2) 2800 GPD watermakers, along with a 24â Edgewater center console, 17â Novurania and two waverunners. Entertainment centers include Crestron Kaleidescape media system with separate receivers throughout. Truly tournament fish rigged with offset fighting chair, outriggers, rod holders, tuna door, commercial icemaker and aft facing control station. Available for inspection in South Florida and will be featured at the RJC Yachts display during the upcoming Miami Int’l Boat Show! Her new asking price is $ 6,495,000. Please contact our office or refer to our website for additional information on this magnificent custom vessel! RJC Yacht Sales & Charter welcomes home STATUS QUO, the 2013 150′ Richmond Tri-Deck Motoryacht! Great news from the captain of the 2013 150′ Richmond Tri-Deck, STATUS QUO, that the vessel has safely arrived back into Fort Lauderdale from her most recent trip up the Gulf to Mobile, Alabama. 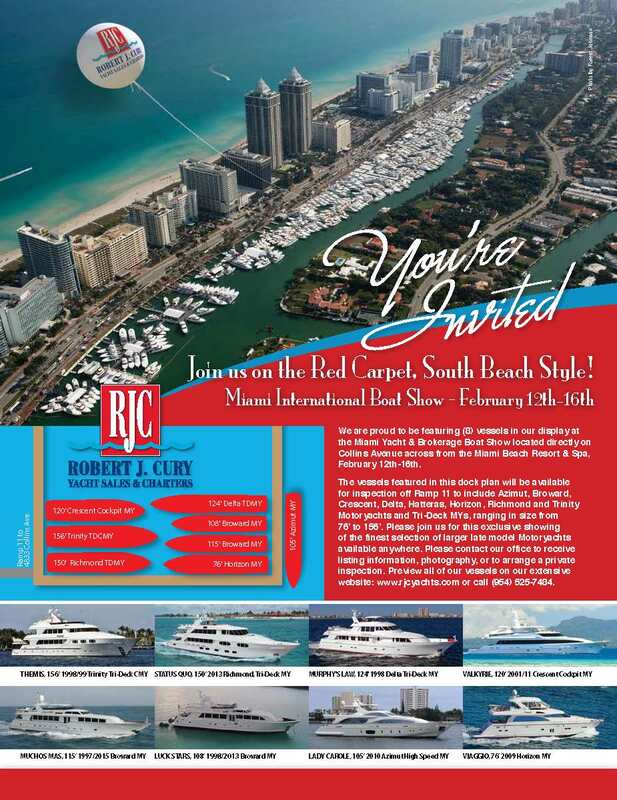 STATUS QUO will begin prepping for next month’s Miami International Boat Show as she will be featured in the RJC Yachts display on Ramp 12, Slip 608. STATUS QUO represents a rare opportunity to purchase a nearly new ABS classed TDMY w/only 640 delivery hours. On-Deck Master w/accommodates up to (12) in owner’s party in a six stateroom layout plus crew quarters for (8). The interior features impeccably matched mahogany veneer joinery w/detailed inlays & flawless finishes throughout. Powered by Caterpillar C32 main engines, Caterpillar 80KW Generators, & Quantum Zero Speed Stabilizers. 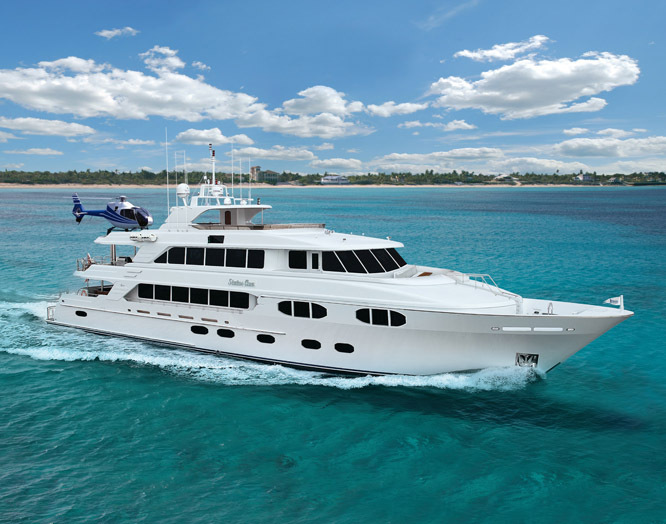 Additional large yacht options include: bow thruster, (2) Sea Recovery 1800 GPD watermakes, Atlas shore power convertor, Alfa lavel centrifuge along with a touch-and-go helicopter pad. 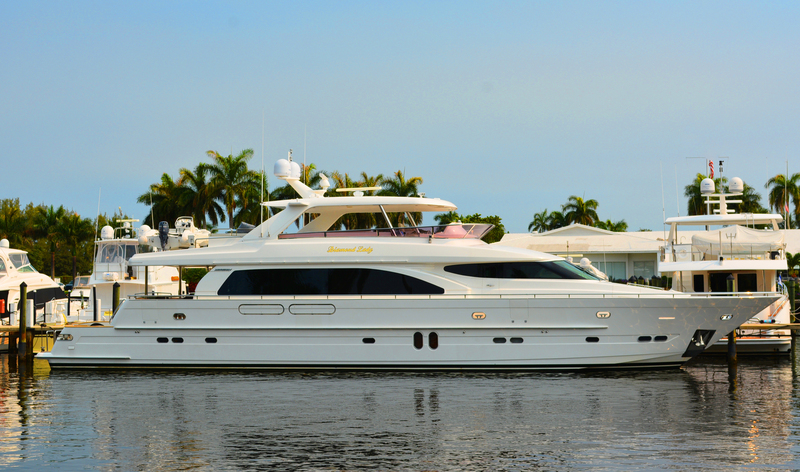 RJC Yachts is pleased to report the sale of the 2005 94′ Horizon CMY, DIAMOND LADY with Bob Cury representing the seller and Mack Carrol of Atlantic Yacht & Ship introducing the buyer. Built by the Taiwanese yard Horizon Yachts, she was designed by John Linbolm and delivered in 2005 as one of the yard’s E94 series. She features a custom interior with African cherry joinery and high gloss Carpathian elm burle inlays. Her comfortable main salon has a dining area with seating for eight, a gourmet galley forward and a large aft deck. Al fresco entertainment and dining is available on her flybridge featuring a custom hardtop, Jacuzzi, wet bar and a 15′ Nautica tender. Below deck there is accommodation for six guests in a three stateroom layout consisting of a full beam master suite aft, a VIP stateroom forward and a twin cabin to starboard, all with full en suite facilities. Powered by reliable Cat 3412’s, she cruises comfortable at 14 knot with 18 knot top end speed. Diamond Lady was asking $2,495,000. 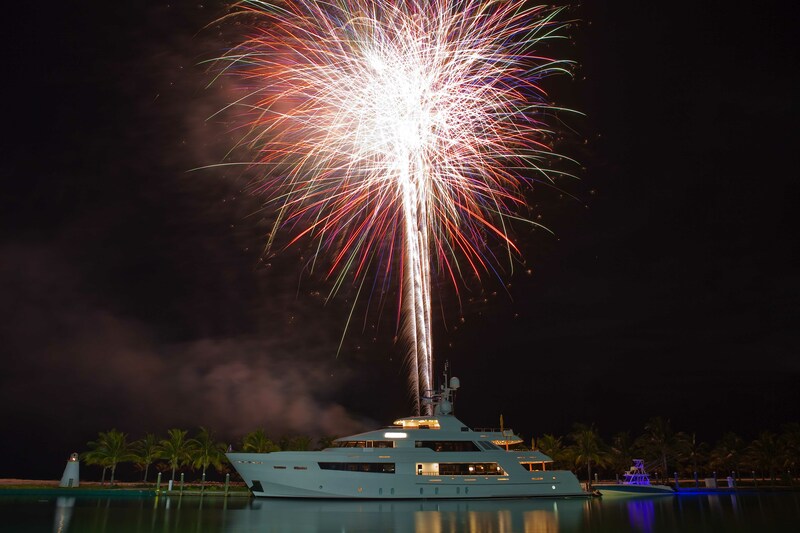 RJC Yacht Sales & Charter wishes you a Happy New Year! With a lucrative 2014 behind us we start off the New Year of 2015 with a lot of different action going on and our office back in full production mode after the joyful holiday season. As 2015 begins it’s foreseen to be yet another record breaking year with lots of yachting news. We look forward to what’s in store and wish everyone a happy, healthy, & prosperous 2015 with lots of smooth cruising worldwide! Please contact our office should we be of any assistance towards your 2015 yachting needs!